Since I put my first bet on the Grand National at the age of 10 (via my dad of course), I have had an interest in horse racing. With my grandparents living on the east coast of Yorkshire it meant we would regularly have days out at Beverley racecourse. When I finally got to the age of being able to put a bet on, I found myself at York university, studying Chemistry. This meant that for every birthday since I can remember, we would go to York racecourse for a day of racing and not once have I actually known why I am betting on a horse other than the mediocre list of numbers that are at the side of the horses' names in the race card. Having been a member of various tipster groups and being subjected to the various highs and lows associated, I decided to embark on a mission of choosing my own horses and see how well I could do. I had a look around a few websites and decided that Geegeez was easily the best tool that I could use to pick winners. As a scientific man I was drawn in by all the stats that are on offer, and also by how intuitive they are. I decided to start off with a theoretical £100 in the bankroll and see how it all went. I made no rules on how much I would spend on a given day, something I'd later regret, and no real limits on how confident I was about the win. All the odds quoted are the odds that were available on the Geegeez website at the time of analysis and these did frequently change when compared to the SP. An absolutely fantastic start to the experiment. I made 15 picks using a mixture of the criteria above. 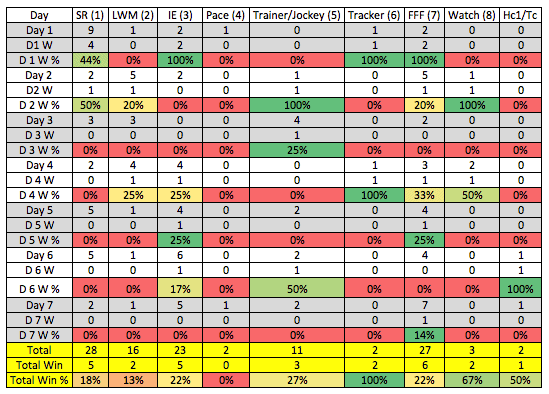 Instant expert, Tracker horses and the FFF returning 100% strike rate. SR gets an honourable mention of 44%. The highlight for me though had to be Sennockian Star at decimal odds of 9.00 who was chosen due to being top of the IE. I went heavy on “Dr. Red Eye” who led all the way then got outpaced late on. A pretty steady day overall, “Monotype” being the highlight which was a pick made on Trainer/Jockey combo percentage. My heavy touch was on “El Grande” who proved to be more of an “El Pobre” in the end and weakened 4f out. Daily Profit/Loss is -£26.20 and Bankroll is at £211.45. Only one winner today and that was “Alkhor”. Mainly picked due to Hannon being the trainer and Frankie being booked. The odds reflected this and were only 1.91. A win is a win though. I really fancied Shady Lane because of the Trainer/Jockey combo but to no avail as he finished a creditable 3rd, only 2 lengths behind the favourite, “Miss Sassypants”. Daily Profit/Loss is -£45.45 and Bankroll is at £166.00. Some nice horses running today, a couple of places help to fill the pot but my big bet of the day returns at odds of 3.50 which makes a massive difference overall. Last winning mark is starting to annoy me slightly, I am quickly learning that they are returning to their last winning mark because the horses are on the downturn of their career. Daily Profit/Loss for the day is +£25.63 and the Bankroll is at £191.63. I do believe this was the day when things started to wrong and the reason it went wrong was mainly due to me going against “Stat of the Day” and doing some crazy staking by putting £50 on “High Ron”. I went with my gut feeling and it cost me big. Everything seemed to point to him but it wasn’t to be. “Urcalin” was a decent win at odds of 3.50 but didn’t make a dent on the day’s overall outlay. Daily Profit/Loss -£87.50 and Bankroll now at £104.13. For the second time, I am playing with my own money. Today I fancied “Tumbaga” which was handicapping for the first time. I had a look at other horses in his previous races and at their speed rating now and he seemed head and shoulders above the rest of the field. “Kyrenia Castle” was a non-runner so we’ll never know what could have been at those juicy odds. Daily Profit/Loss -£38.25 and Bankroll at £65.88. Death or Glory. I decided to place all of my money on bets to see what I could do. I really fancied “Limato” to win and his close second was no consolation. He is a horse who I do believe has a lot more to offer but couldn’t do it today. Daily Profit/Loss -£35.88 and Bankroll at £30.00. So overall for the week I am £70 down on my theoretical £100 bank. It is quite easy to trace these losses back to a few pivotal bets, and some poor staking. I have come to the conclusion that it is important to put a lot of effort into choosing the right bets but it is even more important to analyse your winners and losers, and to stake consistently. Here is the breakdown of my week's bets. As you can see from the table, tracker horses and watching previous races is a very good tool in deciding if the stats have meaning or not (though this did come from very small sample sizes). As with all stats, lots of them are contextual. Trainer/Jockey combos seem to yield quite a good strike rate and often at good odds. I personally think that this is also quite a small sample and shouldn’t be taken as definitive, but what I hope it shows is that every one of the tools can yield winners but the tools are most powerful when combined together. There are so many races that I look at and it throws up about three different horses and this makes it very hard to pick. I know for a fact that in future I will be making a lot less picks due to the Last Winning Mark as this has led to a lot of losses in the week. Bet smaller/more consistent stakes no matter how sure I am. Big stakes are dangerous to the bankroll! After doing this experiment I am going to have a bit of a rest before the next one. I am thinking that I might investigate the value in following Trainer/Jockey Combos and see how profitable that can be when combined with Instant Expert. Firstly, a big thank you to Damien for taking time to sketch out his week for all of us, and an interesting week it was too! It's easy to see that Damien actually has a fair handle on the tools, and has used them pretty well in the main. Whilst I personally wouldn't use the Instant Expert 'last winning rating difference' as a means for placing a bet (there's a reason it's not green, red, amber - there's no direct correlation between the numbers and a horse's winning chance), I think the other methods are all valid. Ignoring that, the obvious issue was the staking. 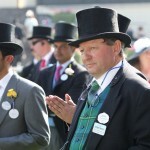 Betting all horses for £5, except the daily £20 bets - and that mental (sorry Damien!) £50 aberration - was the killer. If all bets had been a total stake of £5 (i.e. £5 win or £2.50 e/w), the return on those bigger bets would have been -£22.50. Compare that with the actual -£120 and you can quickly see that there is a whopping £97.50 differential. In this case, that was the difference between a painful loss of £70, and a satisfying gain of £27.50. Geegeez Gold can help you find good winners, but you need to stake sensibly and consistently to make them pay. One other thing on bankroll. This was a notional £100 bankroll for the purposes of a very interesting experiment. Betting 75% of it on day one is a disastrous way to go! One has to manage one's funds for the long haul. On a £100 bank, £5 bets equate to 5% staked - and the £50 bet was half the bank on a single horse!! This is, erm, very not good. I definitely agree about looking for multiple positives, rather than just a single piece of data, to isolate a bet. For instance, when looking at Handicap First Time, I'll respect any trainer with a solid performance in the last year or two in that context, but his horse today MUST have something different in the race conditions (e.g. a step up in trip, different ground conditions, noteworthy jockey change, etc) to be of interest. When multiple horses qualify in a race, it becomes about the market. If you like three roughly equally, and one is 10/1 with the others much shorter, the value bet is the 10/1 shot. That is one way to play the race. Another is to sit it out: if there are three possibles, it's maybe too competitive. 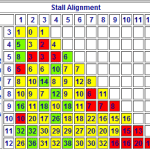 And a third is to split your stake between the possibles you've identified. 1. Stake consistently and in line with your bank. It is reckless to be staking more than 2.5% of bank on a single selection, even if you make it a 'five star nap', and even if you tend to bet at the top of the market. (Most Gold users don't bet at the top of the market as a rule, because they have intel which leads them elsewhere). 2. Use Last Winning Rating (LWR) on Instant Expert as a reference point only. When I was researching the correlation between LWR and Today's Rating, I couldn't find anything especially meaningful. That's why the numbers are in blue, and not Red/Amber/Green. They are for information purposes only. 3. Well done on looking at videos and using your Tracker to find winners. Data can tell us a lot, but if we have the time to use our eyes as well, we'll glean plenty more from between the form lines. 4. I agree that TJ Combo is a great source of winners. In fact, it's arguably the best source of winners in the whole Gold offering. They take a little more finding than, say, Stat of the Day (but not too much more), so won't necessarily be for everyone, but very good - and very gettable - winners are there most days. This was Damien's idea, and I thought it was a really good one. And, as I was writing this up, I also thought it might make a nice occasional feature. So, if you'd like the chance to put yourself under the microscope in a bid to improve your betting - and if you're happy to share, and for me to pick out a few items like I have with Damien - then leave a comment below or email me at the usual place. What a great article, thanks for this. No problem. I quite enjoyed doing it. If you have any ideas that you would like me to follow up as a second project then let me know and I’ll do it. Excellent piece. Thank you Damien. I’ll take this as an omen. I get that a lot, should cover up that tattoo on my skull really. The big bet, oh the big bet. Rang so true. Thanks Damien, really enjoyed reading that. Thanks for taking the time Damien, this is valuable stuff. I’m pleased to see that you have an ‘SR’ and an ‘FFF’ column just like I have on my sheet o’ paper. This paper is my collected-data source & I’ll be damned if I approach the day’s racing without it – regardless of the amount of ‘glitter’ on the latest hot-tipster. An observation: you started scientifically and veered over to ‘mug punter’. When this happens to me it’s often because my brain has decided to shut up shop for the day – in a word – information overload can affect betting psychology! Thanks for that reply. It’s all a learning process and I agree wholeheartedly with you. Stick to your principles for long enough to work out where you’ve gone right as well as where you’ve gone wrong. It was only fake money so no biggie but it has informed me massively about how to bet in future and the feedback I am getting is superb. very interesting read, and it does remind me of myself many years ago, when in the thick of battle rationale seems to evade you very quickly, strict staking is the only way to go. Great article Damien. Explaining mistakes made, and then the advice from Matt to counter the mistakes , helps us all. Easy to post about wins, brave to post about losses. Very interesting especially the concise daily breakdowns a double meaning if ever there was ! the out of the window logic that tells you this is the gut feeling plunge on bet that if you don’t place it your going to regret it moment . Then the” what the bleep bleep hell have i done moment when it all goes belly up i don’t do too badly with reverse forecasts in race’s where i can’t split the front two then another time a gut feeling picks out a series of runners up or a total pup that is lucky to finish at all. I like Charles reply about information overload and brain shut down there was a piece in this months Racing Ahead mag about Epsom Trends for the Oaks at the tail end was the sentence ” The horse from stall 2 has been placed in 6 of the last 11 runnings ” had a look and wrote down Qualify priced @ 66/1 when i read the article after reading so much about the Oaks and Derby my mind drifted off and the rest is history. I’ve been that soldier – lost my bank on more than a few occasions in the past but I’ve learned from my many mistakes and improved my betting quite a bit in the last 5 or 6 years and I am profitable year on year for about the last 6 years. It’s the emotional side of betting that beats most people that are borderline on being profitable. Eliminating bad bets and poor staking is as important as getting good bets. Records as someone mentioned are vital and also some sort of review of those records every so often is equally vital. This helps pinpoint your strengths and weaknesses. You might find yourself bleeding money in maidens / all weather or be especially strong on Irish hurdles for example. This will aid you in specialising which I believe is the key to breaking into the ranks of the profitable. Betting is equal parts art and science in my view. I used to be a hugely systematic punter with an annual sub to a database that cost over £1000 per annum. You know the sort of thing – back all horses ridden by X for Y between April and June in Scottish courses. A very brutal and mechanical approach that worked up to a point but I found some finessing of this approach was much better. I’ve dumped the database and now use only Geegeez and another site at a combined cost of ¼ of my previous outlay. The visual presentation of Geegeez complements that slightly more stats focus of the other site. I work in a very similar manner to Damian but use the various reports for a shortlist that I then break down into best bets. The only 100% rigid system I use at the moment is that I will back any horse that has a speed rating of over 75 on Geegeez and is 15 clear of the rest of the field (not in maidens). Lots of shorties but a good strike rate. It’s difficult to keep your head after a bad day and the temptation to chase losses with a lumpy bet in the last race is always a danger. Tomorrow as someone in one of those black and white movies my mother loves says “is another day”. Almost as damaging sometimes is a very good day and the temptation to play up the winnings with what you consider “bookies money” with a poorly thought out punt when you should be finished for the day. Sometimes I can’t avoid it myself so to scratch the itch I might have a minimal (and I mean €2 minimal) tricast. Good stuff, Brian, and well done on making it pay. I really like the allowance for an ‘action’ bet to ‘scratch the itch’. I’m very much the same. Will buy plenty of cheap action over the course of a week, knowing that I’m borderline clueless. But it keeps me sane to make the bets I think are genuine value. Last Winning mark…..food for a laying system? Appreciated Aaron. Glad it helped. Interesting article. Into the second week if my 14 day trial but haven’t really had a lot of time and still haven’t been through the user guides. That said, the instant expert has been really helpful and has pointed the way to not only some decent priced winners but some short priced, successful lays. I tend to make my own selections and then use the racecards to reinforce (or otherwise!) my view although stat of the day us now followed without question. The staking issue is one I relate to – big bets on losers and small bets on winners which I know makes no sense. Thanks for commenting and I’m glad you’re finding value in the trial. There is a lot to take in, but in my opinion users shouldn’t feel they need to know/use all of the Gold provision to get value from it. As you say, Instant Expert and Stat of the Day are worth more than the monthly on their own (in my considerably biased opinion!). The user guide is a handy reference, and worth dipping into rather than reading from cover to cover – that would doubtless bore even the most actuarially minded of us! Thanks again for your comment, and I’m glad you enjoy the big meeting previews as well. They’re a lot of fun to research and write – though very tiring – and they are the backbone of my own betting, of course.